Figure 1: In the spider plot, the Pittsburgh International Airport project pad 1 is shown in blue, and offset pad 2 is shown in red. Both were designed with negative vertical section and extended lateral sections to optimize lease development and maximize subsequent gas production. 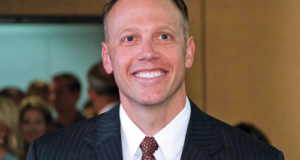 For CONSOL Energy and Baker Hughes, two recent “mile-a-day” wells in the Marcellus Shale were the results of a team approach to horizontal drilling optimization. The wells not only substantially reduced drilling time but also stayed 100% in the target zone despite a challenging physical location. This multi-well pad extended under the Pittsburgh International Airport in Allegheny County, Pennsylvania. It was one of the first in the area to be drilled using a high-buildup-rate rotary steerable system (HBRSS). Among the challenges that face operators in the Marcellus are the topographical features and environmental restrictions that limit pad construction. Increasing production and improving well economics in the current market environment requires multi-well pad drilling with complex well profiles. Optimizing well profiles for a given lease usually means longer laterals, which pose new challenges in terms of torque and drag. Other drilling objectives include keeping the well 100% in the target zone and being able to drill the vertical, curve and lateral sections in one run. 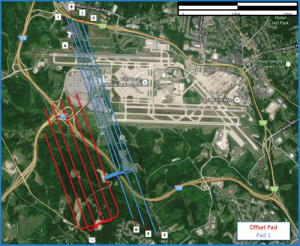 Drilling wells in the vicinity of, and under, the Pittsburgh International Airport presented additional challenges with regard to lease boundaries, build sections, landing points, and torque and drag optimization. Drilling the curve section would require a directional drilling system capable of consistently yielding the desired buildup rate (BUR) to land at the predetermined landing point and then continue to drill the extended lateral, all in one run. Based on their experience and establishment of best practices from drilling offset wells in the Marcellus with HBRSS, the operator and service company decided to apply the technology at the airport project. 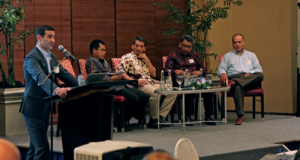 A team of drilling, geoscience and reservoir navigation experts was assembled. An extensive well plan design focused on two main goals: creating the best reservoir exposure for future production and maintaining drilling efficiency and consistency. The team addressed bit-bottomhole assembly (BHA) matching designs and reservoir navigation (RN) techniques, as well as a detailed execution and communication workflow to drill the high build-up curves and extended lateral sections in one run. Figure 2: Well trajectories for pad 1 were based on torque and drag modeling, hydraulic analysis and tailored reservoir navigation techniques. As Figure 1 illustrates, pad 1 and offset pad 2 were designed with negative vertical section and extended lateral sections to optimize lease development and maximize subsequent gas production. The multidisciplinary team decided to define and standardize methods and practices to minimize the cost and time for drilling the 8 ¾-in. curve and lateral sections for pad 1. The optimization process focused initially on offset data analysis from pad 2 to determine opportunities for improvement with a focus on directional drilling, RN techniques, bit and BHA match, active drilling parameters management, and best practices implementation. A typical well design included batch drilling the 17 ½-in. and 12 ¼-in. sections to approximately 600 ft and 2,200 ft true vertical depth (TVD), respectively, using air drilling techniques. 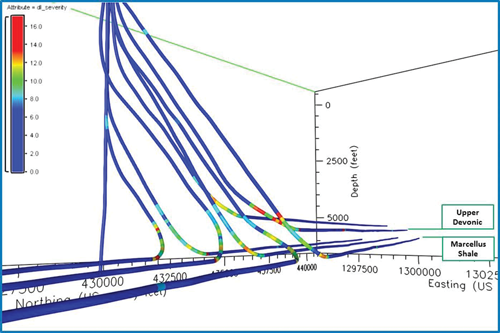 Wellbore trajectories were based on torque and drag modeling, hydraulic analysis and tailored RN models. The 8 ¾-in. production hole section was inclined through interbedded formations up to the kickoff point, where a high-dogleg-severity (DLS) curve was required to land and align the well path along the correct azimuth. Reservoir navigation would be required to ensure maximum formation exposure through the extended lateral to the defined total depth (TD). An offset analysis was performed on the six wells on pad 2, which were drilled immediately before pad 1, to define the main areas of focus and potential performance constraints. Two main target zones were planned with a 500-ft TVD difference. The 2D and 3D trajectories developed and executed for the 8 ¾-in section had various BURs from 8°/100 ft to 10°/100 ft and horizontal sections in both the Upper Devonian (Rhinestreet and Burkett shales) and Middle Devonian (Marcellus shale) formations. Reservoir navigation techniques addressed subsurface rock correlation for Pennsylvania and discrepancies between different areas. Based on previous experience with Burkett wells in adjacent areas, it was expected that geosteering in the Upper Devonian shale would face up-dip formations requiring dedicated attention. It was also expected that Middle Devonian shale bed dip undulations would cause oversteering in the offset wells. Figure 3: The plots show the performance of the three primary Marcellus PDC bit designs used from 2014 to 2015. The HBRSS technology was a key enabler for the project, but these wells represented a significant change that would require pushing the working limits of the technology. Since 2011, CONSOL Energy has drilled more than 1 million ft throughout Pennsylvania, Ohio and West Virginia using the Baker Hughes AutoTrak Curve HBRSS. In addition to the high dogleg capabilities required for the curve section, the system had been able to precisely drill vertical, tangent and lateral sections in one run. The automated closed-loop steering control allowed continuous steering for this critical wellbore placement. Other relevant HBRSS features included real-time, near-bit inclination for holding tangents, BUR projection ahead, accurate landing projection and TVD control during horizontal drilling. Additionally, real-time, near-bit bulk and up/down gamma services were used for RN in these extended-reach wells. Real-time near-bit vibration sensors made it possible to optimize drilling parameters and to drill quickly without compromising wellbore stability or tool reliability. This automated downhole system proved essential for geosteering in the Marcellus, where the production sweet spot represented by a narrow window (usually less than 5-ft thick) is affected by quick bed dip changes. Figure 4: The generic Marcellus shale HBRSS PDC bit design (left) was modified for increased aggressiveness for the Allegheny County airport project (right). Between 2011 and 2013, the BHA and drilling progressions led to a shift from a non-motor-assisted to motor-assisted BHA design to allow for longer laterals and increased rate of penetration (ROP). By 2013, the shift to motor-assisted HBRSS BHAs was complete. While drilling the Allegheny County offset pad 2 wells, the Ultra XL/RS motor, a reduced-speed motor with a 0.21 rev/gal speed to flow ratio, became the standard for the area. 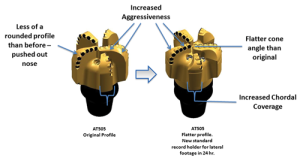 Benefits included additional bit torque at lower bit RPM, increased drilling efficiencies, and the preservation of the bit from abnormal damage while drilling through continuous hard and soft interbedded formations. This motor, designed to run through high DLS, provides additional rotation and handles the high differential pressure required to push the performance boundaries. Additionally, the non-magnetic stabilizer above the HBRSS was replaced by a higher-grade non-magnetic flexed stabilizer for pads 1 and 2 to improve system flexibility through the higher DLS wellbores. The entire BHA underwent finite element analysis to check BUR capabilities and bending moment limits as well as static and dynamic scrutiny to ensure the best performance. Figure 5: The record mile-a-day well achieved 100% in the target zone, drilling up-dip on Upper Devonian (Rhinestreet shale). The PDC drill bit design evolution for the Marcellus has been influenced primarily by the bit’s high BUR steerability. However, dynamic and thermal stability, borehole quality, durability and hydraulics have all been considered for each application and overall drilling performance. 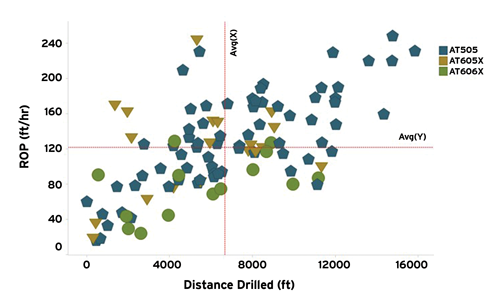 Figure 3 graphs the ROP and distance-drilled performance of three main PDC bit designs used in other Marcellus areas drilled between 2014 and 2015. The six-bladed, 19-mm cutter PDC bit with backup cutters (AT606X) was designed for higher/shallower kickoff points and tangent sections drilled through abrasive formations. The five-bladed, 16-mm cutter PDC bit (AT505) showed increased ROP and BUR performance and is suitable for deeper kickoff points. Based on experience and offset pad 2 data, the drilling optimization team planned to drill two main segments in a single run for pad 1: the curve and lateral sections. The curve section would be characterized by highly imbedded abrasive silt and soft shale formations, making it hard to anticipate or observe with gamma readings while drilling. In these formations, it would be important to maintain proper drilling parameters to prevent damage and premature cutter wear on the bit. The lateral section would be characterized by clean shale and minimal risk of bit damage. The goal for the HBRSS-customized PDC bit was to provide durability, stability, consistent BUR yield, fine-tuned steering capabilities, endurance and fast penetration rates while delivering long and reliable laterals. Figure 4 shows the evolution of these key features for the AT505 bit chosen to drill the airport wells. The airport project team’s Marcellus HBRSS drilling knowledge helped to optimize the workflow and implement best practices, including real-time streamed data, specific drilling techniques relative to each hole section, and excellent communication among the multidisciplinary groups. 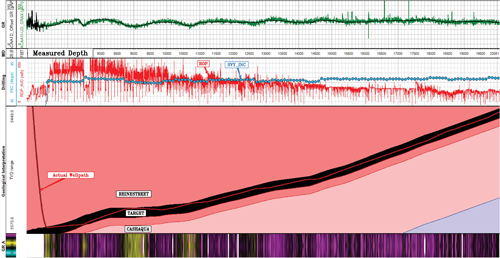 Real-time data transmission via wellsite information transfer standard markup language enabled geologists and reservoir navigation service (RNS) personnel, and others working offsite, to view information from the rig’s surface drilling data, and from the tool itself 30 seconds after it was recorded into the database. Viewing the information so quickly enabled the offsite personnel to quickly observe trends between parameters, predict apparent formation bed dips before a survey post and make changes to stay in the assigned geological target window. Four years of collaborating helped build a trust level between the operator’s geology department and the service provider’s RNS teams. RNS discussed and received geology approval for any landing point changes and inclination changes of 0.5° or greater. However, RNS had the ability to make inclination changes of less than 0.5°/stand in the lateral without prior operator approval. This freedom enabled quicker changes and improved overall drilling performance. The change was often made at the start of the stand, so the directional driller could pair it with any other needed changes, minimizing overall downlinks. RNS provided constant updates to all pertinent parties from the start of the curve to TD in the form of email updates that showed where the actual position of the bit was in relation to formations of interest and the target window. These updates also provided apparent bed dips and comments about the stratigraphic movement or drilling issues that had occurred since the last update. Best practices for both on-bottom and off-bottom situations were identified and agreed upon jointly by onsite and offsite personnel. 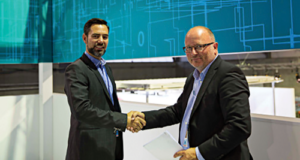 This collaboration provided a sense of ownership and added to the motivation and commitment of the team. Since 2011, CONSOL Energy has drilled more than 1 million ft throughout Pennsylvania, Ohio and West Virginia using the Baker Hughes AutoTrak Curve HBRSS. Three HBRSS benefits – the ability to distinguish the gamma ray readings above and below the tool, hold a specific target inclination and obtain additional tool-specific data for azimuth control – were crucial for horizontal drilling in the Marcellus, which has distinct gamma ray readings throughout the formation. Once landed, the HBRSS system was set in the automatic steer mode-holding angle to a desired target inclination. The command was downlinked through small mud flow variations, which were decoded by the downhole tool. Sufficient force was then applied to hold angle, minimizing wellbore tortuosity and downhole dysfunctions. Focus on reducing connection times was another important success factor. The rig crew was motivated and focused on reaching the mile-a-day target, aligning the team to the same goal. Survey time was optimized using the tool capability for flow-off surveys by conducting measurements during connections and allowing the directional driller to get back on bottom quickly. Active drilling parameters management controlled both borehole and downhole dynamics quality. Since torque and drag were one of the biggest constraints to delivering longer laterals, wellbore quality was assessed and monitored in real time to minimize downhole dysfunctions, improving overall drilling efficiencies. The information in this article was adapted from IADC/SPE-178875-MS, presented at the 2016 IADC/SPE Drilling Conference and Exhibition, 1-3 March in Fort Worth, Texas. Great post. Thank you. May I ask the thickness of the target interval?